This tutorial is base on stone size 3.0 x 2.8 cm. If you have bigger or smaller stone, the pattern will not be the same, you can add or reduce some cords as in instructions. 1. Cabochon stone, size 3.0 x 2.8 cm. For stone wrapping = around 3.6 m.
For body pattern = 17 m.
for head pattern = around 7 m.
size 3.2 mm. 16 pieces. size 5.0 mm. 1 piece. tear drop pendant 8.0 mm. 1 piece. 4. Stone bead, rounded size 1 cm. 1 piece. 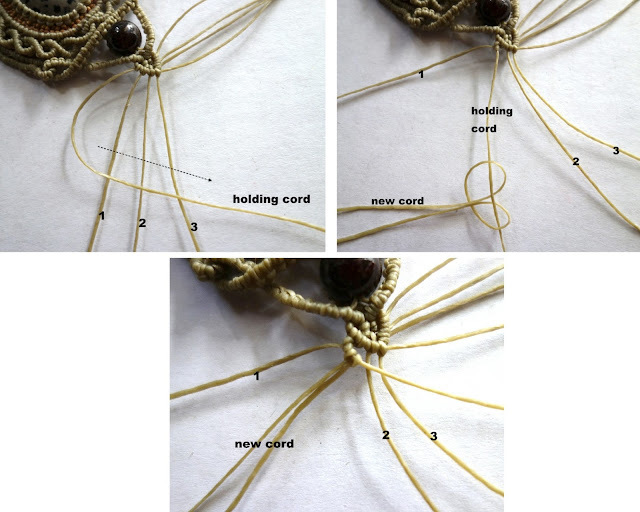 Wrap the stone following Lace style until step 7 http://ecocrafta.blogspot.com/2013/02/macrame-wrapping-technicmedium-stone.html for holding cord I use 2 cords x 60 cm. each, for working cord I use 2 cords x 120. cm each. Leave the rest of 8 cords to use in body pattern. Use the 60 cm. cord (total around 24 cords), Fold them into the half (y ou will get 30 cm. cord each), thread them into the lace around stone, you will now get 48 cords , 30 cm. long each. (you can see details in http://ecocrafta.blogspot.com/2016/07/primitive-necklace.html). Altogether with the stone wrapping 8 cords(you can see in the bottom part or picture above, now you will have 52 cords around your stone. Adding Brown cord 150 cm. Knotting Vertical half hitch to the right around every hemp cords. Tie double half hitch bar to every cords around the stone. 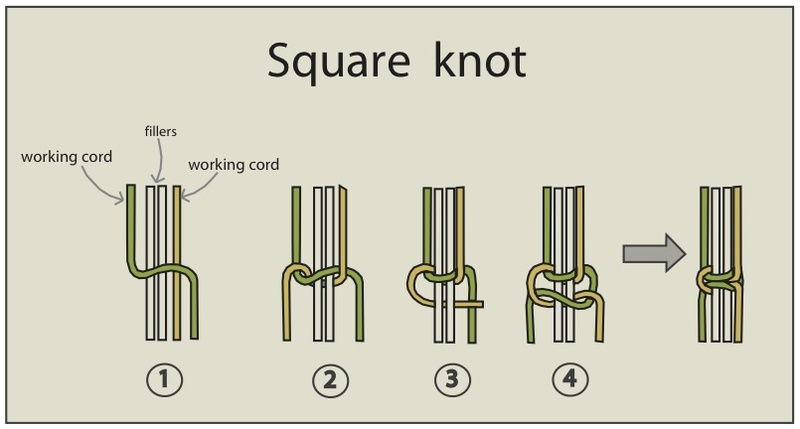 At the end, tie 2 holding cord (Brown cord) with 1 Square knot without filler. Cut and burn the rest at the bottom / back side of stone. Work on the top of stone, septette the cord around stone into Left and Right side. Adding new cord 150 cm. cordFold it into the half to start with, This cord will use as holding cord. Start at the middle top of stone. Tie double half hitch bar form 1 -3 cord, Left and right side. Use cord 1 as a holding cord, cord 2 as a working cord. 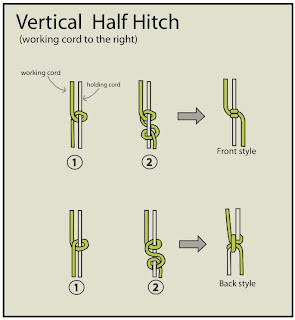 Tie vertical half hitch to the left (1 knot), then tie vertical half hitch to the right, left, right, left and right, altogether 5 knots of verticle half hitch, to make a knot line. Use cord 1 as a holding cord, skip cord 3. Tie double half hitch bar use cord 4, 5 as a working cord. Use cord 1 as a holding cord, cord 5 as a working cord. Tie vertical half hitch to the right (1 knot), then tie vertical half hitch to the left, and to the right again, altogether 3 knots of verticle half hitch. Use cord 2 as a holding cord, cord 4 as a working cord. Tie vertical half hitch to the left (1 knot), then tie vertical half hitch to the, right, left, right and left, altogether 5 knots of verticle half hitch. 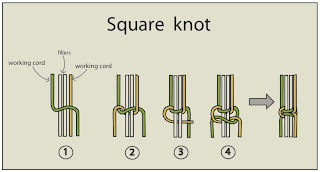 You will get 2 short knot line, cord 1+5 will be threaded with brass beads, cord 2 will continuing use to make S shape patten. 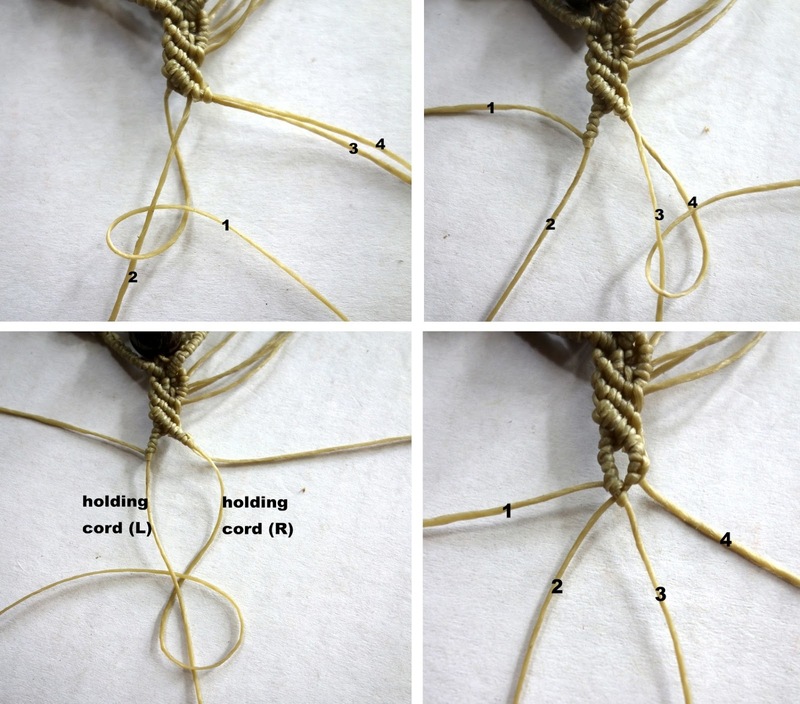 Use cord A as a holding cord, tie double half hitch bar use cord C, D as a working cord. Use cord A as a holding cord, cord D as a working cord. 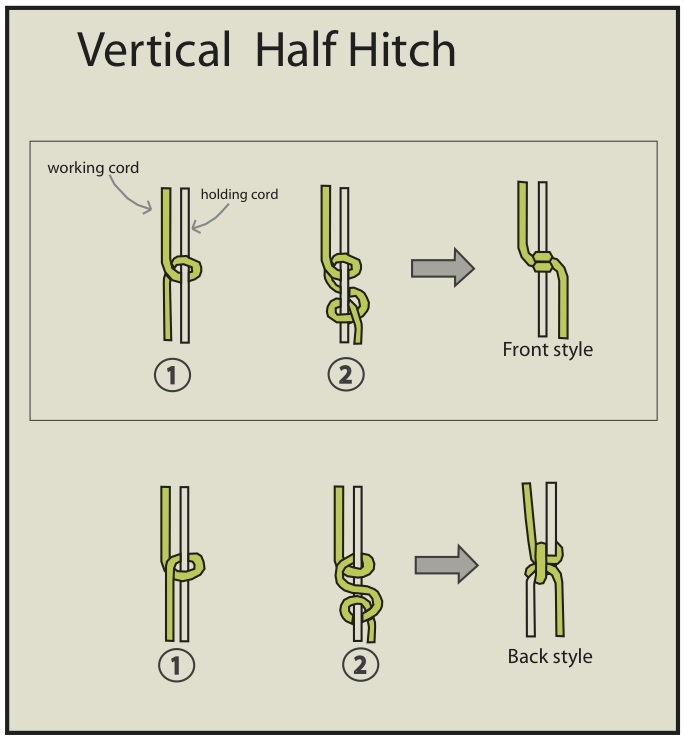 Tie vertical half hitch to the right (1 knot), then tie vertical half hitch to the left, and to the right again, altogether 3 knots of verticle half hitch. Use cord B as a holding cord, cord C as a working cord. 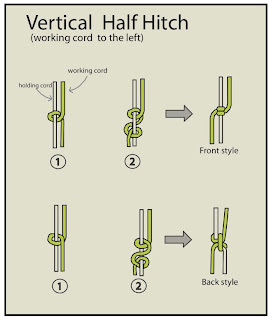 Tie vertical half hitch to the left (1 knot), then tie vertical half hitch to the right,left, right and left, altogether 5 knots of verticle half hitch. Cord B will be (A), Cord C will be (B) on the next S shape, continue this pattern until reach the bottom of stone. 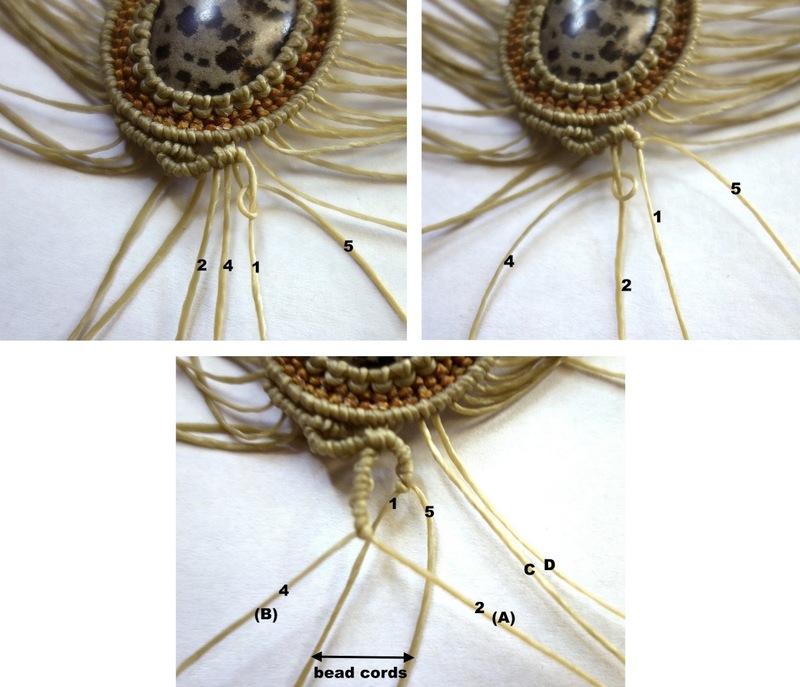 You may skip some cord to make equal shape in a pattern. Work on the Right side of stone same process, from top to bottom. Thread bead cords (2 cords of vertical knot line) in to 3.2 mm. brass beads. altogether 16 beads around stone. Adding new cord 40 cm. cord, fold it into the half, This cord will use as holding cord. Start at the middle bottom of stone. Tie double half hitch bar form 1 -2 cord, Left and right side. Work on the Left side first, cord 2 as a working cord. Tie vertical half hitch to the left (1 knot), then tie vertical half hitch to the right, altogether 2 knots of verticle half hitch around New cord. Tie double half hitch bar form A -B cord. Then Adding 2 Verticle half hitch by Tying B around holding cord again to make enough space between each brass beads. Continuing this method until reaching the last brass bead on left side, work on the right side same things. 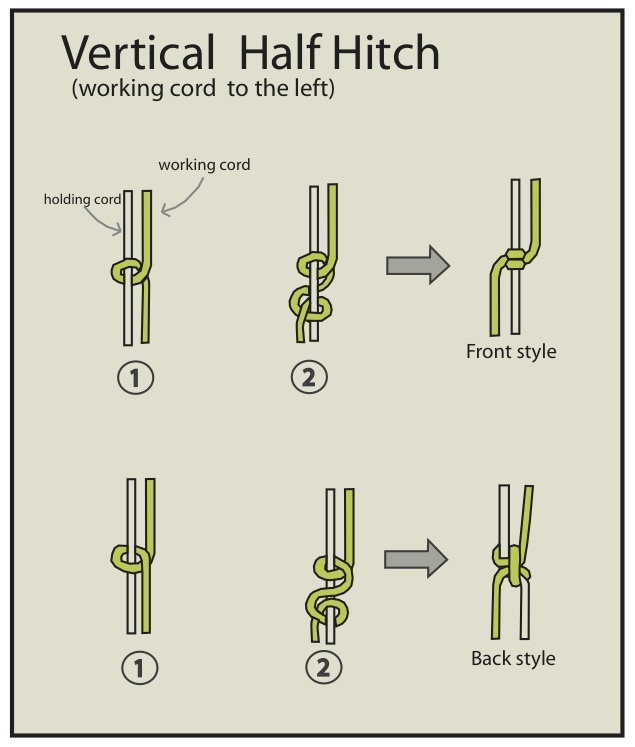 Work on the Left side first, make a knot line by then tie cord 1 vertical half hitch to the left, right, left, right and left, altogether 5 knots of verticle half hitch. Then continuing tie double half hitch bar form 2 cord to bottom. This will create a small hole at the top. Leaving 1 cord in the middle for brass bead. 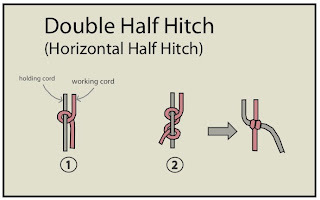 Make more short lines by tying some vertical half hitch again. Work on the Right side same method. Thread 8.0 mm. brass beads into 2 holding cords at the middle. then tie holding cord at the middle with square knot without filler. Cut and burn every cords except 4 cords at the top, keep the burning point at the back side. Now you are finish body pattern. Thread stone beads into 2 cords at the middle. Use 2 new cord, shorter cord 150 cm. will be holding cord, longer cord 240 cm. will be working cord. Start everything at middle point of the cords. 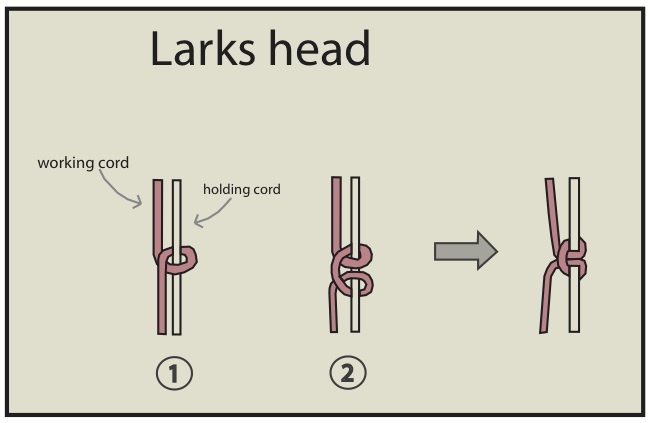 Tying lark heads around 54 knots more or less depend on the next step. You will get Lark head knot line. Thread this Lark head knot line into left and right hole as in the left picture. Fold the rest of knot line to the stone bead, check the length of knot line to reach the top of the stone. 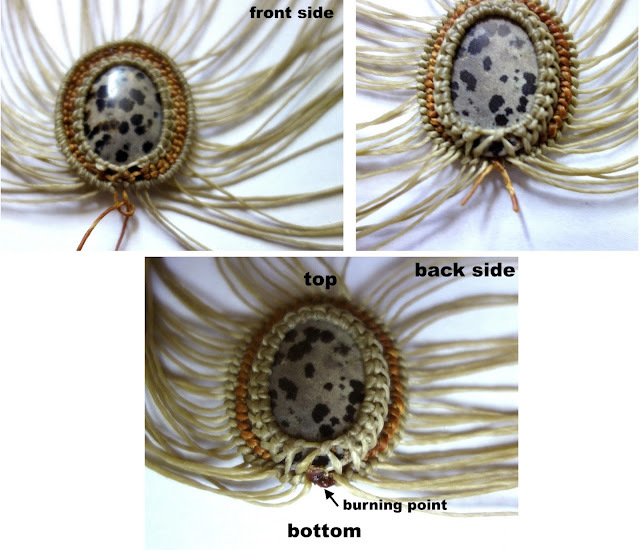 Work on back side, use 1, 2 cord making lark head knot lines, this line should reach top of stone beads. 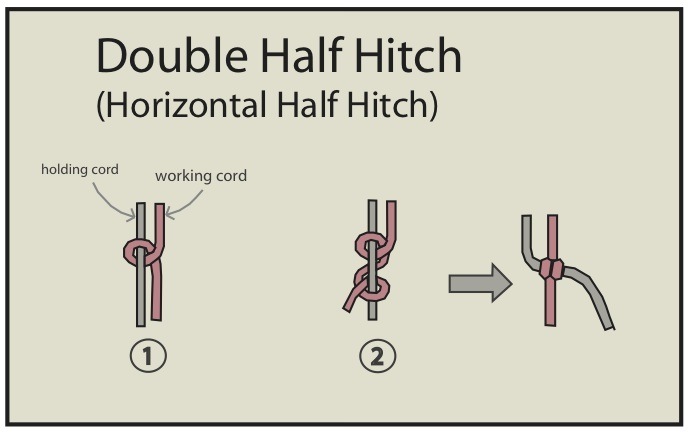 Turn the pattern up side down, connect left and right side of the project by tying 1 horizontal half hitch around knot lines. 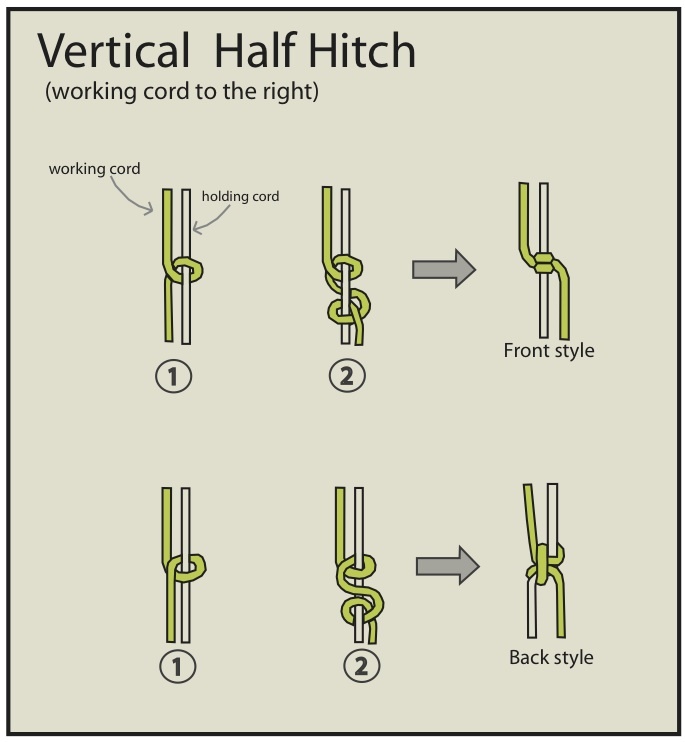 Use the most left and right core as holding cord,Start tying double half hitch bar from 1-3 cord. both left and right side. Tie holding cord in the middle with square knot without filler. Now you finish head pattern. On the left side, now there are 4 cords, 2 cords are long, and the rest 2 cords are short. We will keep 2 long cord continue as necklace line. 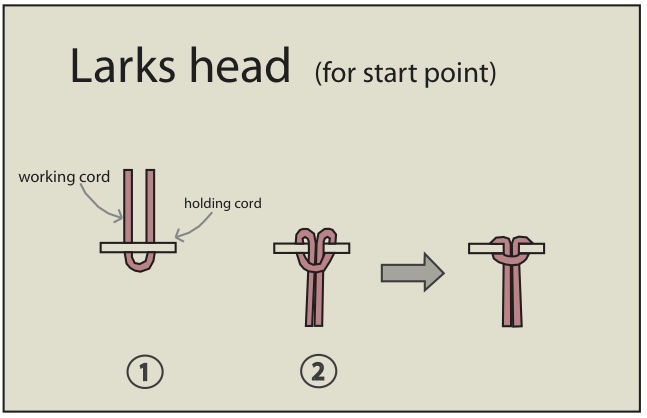 use the left cord as a holding cord, Start tying double half hitch bar from cord 1, then adding new cord 120 cm folding at the half by tying lark heads(keep the knot backside) into the holding cord. Continuing tie double half hitch bar from cord 2 and 3. Use 2 left cords as holding cords, Start tying double half hitch bar from cord 1-2-3. Then cut and burn 2 short cord, now you will have 2 long cords to make necklace line. Make a spiral loop pattern by Use cord 2 as a holding cord, cord 1 as a working cord. Tie vertical half hitch to the right (1 knot), then tie vertical half hitch to the left, and to the right again, altogether 3 knots of verticle half hitch. Use cord 3 as a holding cord, cord 4 as a working cord. 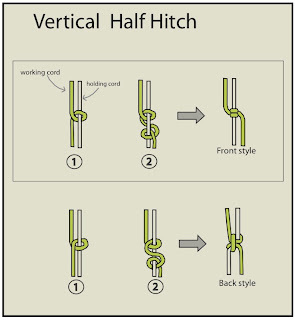 Tie vertical half hitch to the right (1 knot), then tie vertical half hitch to the left, and to the right, altogether 3 knots of verticle half hitch. Now you finish 1st spiral loop pattern. Continue the loop 2-3 loop before braid the rest of the cord to be a necklace line.